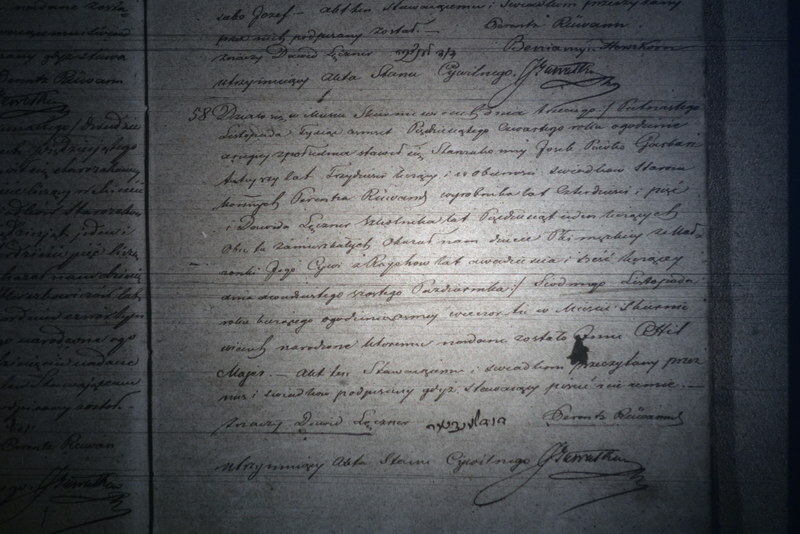 In mid-December, I drove across the flat plain from Poznań to the city of Łódź, where I found the birth certificate of my great grandfather, my babcia Halina’s father. So here is one more fragment that connects me to Poland, and to my Jewish heritage. From it, I learn that in Skierniewice on the third/fifteenth of November, 1854, Josek Piwko, tanner, age thirty appeared with two witnesses (I can’t read the first’s name, but he’s listed as a laborer, age forty-five; the second is David Lęczner, szkolnik [teacher? ], age fifty-one) to report that he and his wife Cywia (maiden name Raych), age twenty-six, had a son Hiel Majer on the 26th of October/ 7th of November. Someone, maybe my great great grandfather? Signed the document in what looks like Hebrew letters. The image quality is poor because I had to photograph the image on a microfilm reader. In other archives I have gotten to page through the actual record books. To me it looks like maybe “Majer” or “Mejer” was spelled with a “j,” not “y” in the original birth certificate. Thanks for noticing–I was tired when I wrote this post, so I appreciate the correction.